Photo: O. Hardee, Chislehurst, The Book of The Cat (1903) by Frances Simpson. Courtesy of The Harrison Weir Collection. In many respects, the Tortoiseshell Persian began as somewhat of an underdog in the world of pedigreed cats. They seldom, if ever, attained distinction on the show bench. In fact, in the very earliest years of the fancy, the novelty of the 'male Tortoiseshell', invariably short-haired, (which we know today as a genetic 'sport'), is what attracted headlines, so much so, that they usually had a class specifically assigned to them! Above left: Mr. Smith's prise-winning Tortie He-cat, exhibited at the Crystal Palace, 1871. 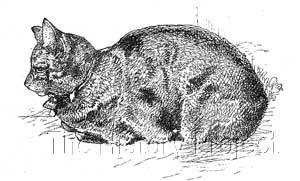 Above right: A tortie female, that also appears on the cover of The Cat Club's Register, Vols 1 and II. 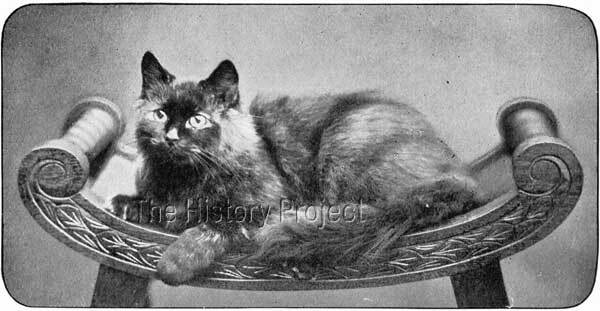 From her listing in the Cat Club Register, 'Topsy' was born 17th February, 1895; sired by Mrs. Herring's 'King Harry' and out of Mrs. Bignell's 'Fluff'. While this appears to be in order, it is in fact ambiguous, as over a period of time Mrs. Herring had registered THREE males with the name of 'King Harry' and two of these were likely contenders as the sire of 'Topsy', both being 'Orange' males. The first is 'King Harry' (NCC: 2272)3, described as an Orange and White, imported, and previously owed by Mrs. Davies. The second contender is 'King Harry' (NCC:3133)3an Orange male, owned by Mrs. Herring, winner of several firsts ad specials. In both cases, their ancestry and breeder are unknown, and their dates of birth are also unrecorded. The dam of 'Topsy', is simply listed as Mrs. Bignell's 'Fluff'. (CCR:Vol.1, Pg16)2. There are 54 different cats named 'Fluff' across the registers, many of which could have been the dam of 'Topsy'. But suffice to say that in the question of the colour of 'Topsy', her dam 'Fluff' is likely to have had a bearing on the colour of her daughter's progeny, which we will touch upon later. Breeder and owner: Mrs. G. Bignell. Sire: Duke of Kent	Dam: Topsy of Merevale. Bred by Mrs. Bignell and sold to Mrs. Laurie. Sire: Ch. Johnnie Fawe	Dam: Topsy of Merevale. Bred by Mrs. Bignell, and owned by Miss Adeline T.Lincoln (Massachusetts,USA). Bred and owned by Mrs. Bignell. From this last litter, we can confirm that 'Topsy' bred correctly as a Tortie carrying dilute. But we still have the mystery of where the silver genes came from in order to regularly produce 'smoke' progeny. When we investigate into the heritage of both parents, we find nothing but contradictions across the registers. In all, 'Duke of Kent' is registered as a Blue (solid), all listings giving his sire as Mrs. Herrings 'Blue Jack'. Some listings give his dam as 'Fluff' and others give his dam as 'Marney'. 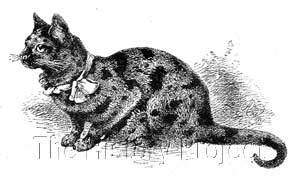 But in the Cat Club Register, the entry for 'Duke of Kent' himself is unequivocal, the dam is given as 'Marney'. No indications here of any 'smoke' or genes for silver. When we investigate 'Topsy' things get even more complicated. Her sire is 'King Harry' one of two 'Orange'(or 'Orange and White') males, which bodes well for her being listed as a tortie. But neither of these are likely to have been smoke or silver. Which only leaves her dam 'Fluff'. And it's here that we strike great difficulty, as there are some 54 cats named 'Fluff' across the early registers, only six of which have been identified with 'proper' names, many of them having probably been 'pet' names which had filtered through to their pedigrees. A dam sibling of 'Topsy' was 'Lulu of Merevale', a Cream male, sired by 'Duke of Kent'. What this tells us is that for a Cream male to be produced by a Blue sire, the dam had to carry the 'o' gene in her coat. So Fluff had to be either Blue-cream or Tortie. As either, this would fit into her producing 'Topsy' (a dense tortie) when mated to an Orange. But that is where the trail ends. So the answer appeared to be, that we would need to discover whether 'Duke of Kent' had sired any smokes, other than those that he produced with 'Topsy', except where he had been mated to verifiable smokes or silvers. The answer was there were none. Only from his breeding to 'Topsy' were there smokes in the resultant litter. 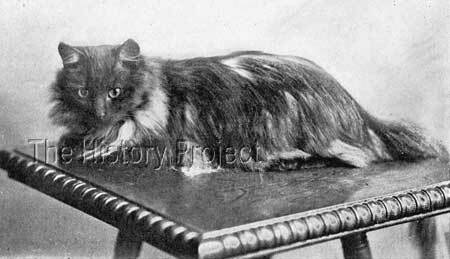 What this tells us is that 'Topsy', although she looks like a straight Tortie in her photograph, was very probably a low-grade tortie-smoke, and if we were able to part her fur, she is likely to have had a base coat of low margin silver. There is no doubt in the writers mind, that the very astute Mrs. Clinton Locke would have seen and known both parents of her 'Baby Flossie' (soon to become) her much beloved 'Lockehaven Lucy Claire'. The story of 'Topsy of Merevale' and in particular, with relevance to her progeny, clarifies for us today, the difficulties experienced by early breeders in registering their cats with only limited knowledge of feline genetics. It is also a reminder that not all colours received equal recognition or attention from breeders. The standard for the Tortie was written with an expectation of a clearly delineated patched cat, without brindling or intermingling, which as we know today, was an exceptionally hard call without the assistance of the white spotting factor to break up the colours. It's fair to say that the rise and appreciation of the Tortoiseshell went hand in hand with the rise in fortune of both reds and red tabbies. As reds improved in type, so did their tortie daughters, and by the time Reds were a dominating force on the show bench, sensible breeders were beginning to assign true value to their Tortie queens all the more. In the modern era, the Tortie has become one of the most valued and appreciated of all breeding options. And in the show ring, they have successfully completed for the highest honours possible. The Torties had arrived! And they continue to be an asset and an inspiration to us, to this day. Registers associated with this article include the National Cat Club (NCC), The Cat Club (CCR), US Register & Studbook for Cats (USR), The Studbook of the American Cat Association (ACA), and the Studbook & Register of the Cat Fanciers' Association (CFA).